I first heard about the book back in July through Konrad's Facebook page and immediately decided I wanted a copy. When I was on the ferry to Islay two weeks ago it turned out that Konrad was on the ferry as well, returning from a holiday on the continent. A few days later I visited him on Jura, where I joined him and visiting friends on a drive up the only road on Jura and of course picked up my signed copy of the book. So, what can I say about the book apart from that it is fantastic? Well, you can preview it on Blurb, then if you like it (which I'm sure you'll do) you can order it via Konrad's website. 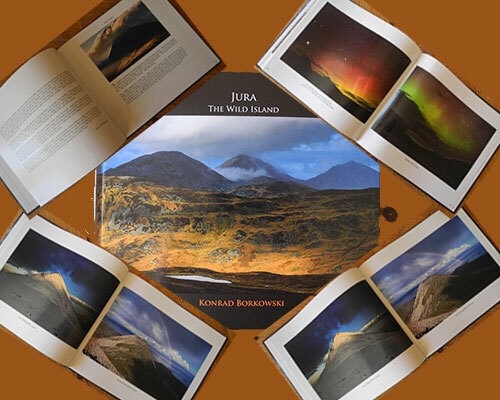 The book contains 75 pictures of Jura's amazing landscape and wildlife by day and by night, from the ground and from the air. Konrad really understands light and goes to great length to get the right picture. I'm struggling to pick a single favourite, the Rainbow over Beinn Shiantaidh, the Northern Lights at Lagg and a great picture of a White-tailed Eagle are among my favourites. There's so much to choose from.